Well hello imaginary friends, sorry this review’s a day late but what can I say I lead a ‘what I call’ exciting life. Meaning I mowed the lawn yesterday and it tired me out completely. It was an eventful task, you see I had to move the lawn mower over concrete to get the last patch of grass on the other side. I’m not familiar with mowers (or manual labour) so I had no idea how to do this without breaking a blade. I lifted the blasted thing, it’s freakin’ heavy, at an odd angle and it started smoking profusely and stopped working. The lawn mower’s somewhat new and also belongs to my mother so when it stopped working so did my heart. Oil started dripping and the thing you pull to start it wouldn’t pull. Mum kept yelling out why the lawn mower was off and each time I heard her voice I about passed out from fear. I was also in a dress so it provided no layering should she find her lawn mower broken and decide to come at me with the machete. I tell you now when I looked up and saw my mum standing there, the machete she uses to attack weeds in her garden with in her hand, I contemplated faking a seizure. However by some sheer stroke (pun) of luck I pulled the string and the engine roared to life. You have no idea how narrowly I avoided death yesterday, Samoan mums are renowned for their quick tempers and boomerang jandals, but my mum? She’s renowned for her quick tempers and even quicker machete thrust. Heh, thrust. Right, Miranda! Sorry about the long anecdote now on to the episode! First of all. Penny for, what I call, Power! Wouldn’t that be just a little bit terrifying? Yet still ‘such fun!’ I’m sorry but tax break for anyone willing to marry Miranda? Oh Penny, you are, what I call, bloody hilarious. Tax evasion: SUCH FUN. Big News: Gary has been dating and is now an item with someone named Rose. Miranda’s face was nothing compared to mine. How dare they mess with my OTP? When Miranda throws food in Rose’s face, priceless, in fact any interaction between Miranda and Rose is hilarious. Although Miranda is borderline, outright mean. It’s not really Rose’s fault that Gary is one half of my OTP. In all seriousness however I think it’s necessary for Miranda to not be so hung up on Gary, surely if they were meant to happen they would have happened already. Granted they have but I believe they need to be apart and emotionally attached to other people in order to fully appreciate each other. 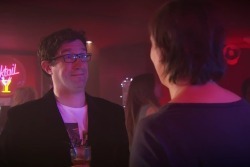 We end up in the club where Miranda meets Michael because Tilly has a freakout about being in their mid-30s, single and doing some curry exam. Sh convinces them they need to go out on the pullingtins. Tilly-isms. However it takes Gary and his girlfriend jogging and winding up in Miranda’s flat and asking to shower in her house (what? Why? Who does that?) to convince her. While both Tilly and Stevie find guys to dance with fairly quickly Miranda, dancing a bit like a thunderbird who needs a wee, does her usual fine job of attracting men with her idiosyncrasies. Read as: not very well at all. Until, Michael! The reporter who called Miranda ‘lovely’ in It was Panning! Sorry but Miracheal is kind of an adorable name. I hope he doesn’t go the way of Danny from the first episode of series 2, one episode and gone, which is unlikely now that he’s legitimately her boyfriend. They’re adorkable. I mean, he calls her QUIRKY. And this guy came back despite how many embarrassing moments he caught Miranda in. Also, they both had a hunch! Trust Miranda to be arrested for impersonating a police officer. Trust her mother to suggest they swap clothes when the police leave the room so that Miranda could make it to her date on time. That entire scene had me in stitches. Don’t sing- BURSTS INTO SONG. Such fun! This year’s laugh. Always ending up half naked somewhere. ‘You know when you get nervous socially, you end up lying to impress?’ Yes, Miranda will never stop doing this and in this episode she’s a special constable volunteer police and scuba dives. But we all do it, completely fine. Helloo and good mowwwning. Nik naks, nikkity naks. The wobbilly, bobbilly fleshy bits. CRINGE WALK. I shall you leave you to ponder this important question… WHERE’S CLIVE?! I really miss Clive! In the whole time he was in the show, we barely learnt anything about him but he was such a great character that it is sad that he wasn’t in series three. Me too! He had some of the BEST lines and his delivery was always on point. It’s so unfair that we didn’t even get a proper explanation of his exit. Previous JawkwardLOL wondering: When do you give up on a TV show?